You are here: Home / Rules / Come Into the Kitchen [Pretty Much] Anytime – Just Don’t Volley While in There! Come Into the Kitchen [Pretty Much] Anytime – Just Don’t Volley While in There! One of the primary differentiations between tennis and pickleball is that, unlike in tennis, in pickleball there is a non-volley zone (most often referred to as a kitchen) in which players cannot enter and volley. Hopefully, the following provides clarification for this oft-misunderstood rule. 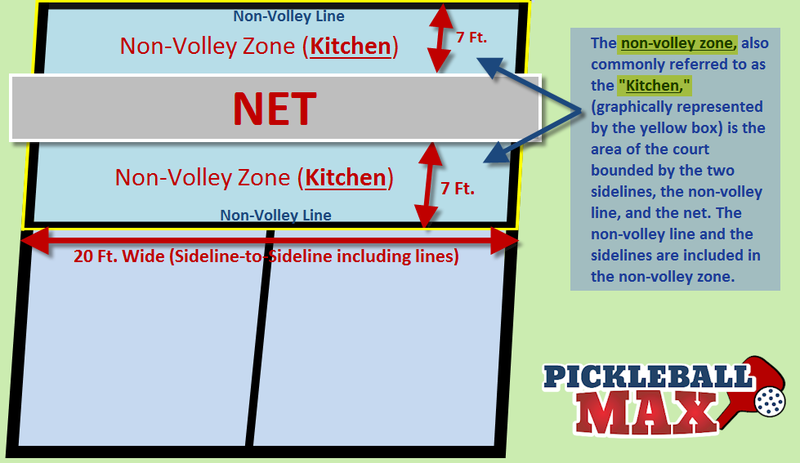 The Kitchen is simply the two-dimensional area on the pickleball court (7 Ft. x 20 Ft.) bounded by the two sidelines (including the lines), the non-volley line (including the line), and the net. When Can I Enter in the Kitchen? You can enter the Kitchen at any time as long as you don’t hit a volley while in there. What if my momentum carries me into the Kitchen? A fault will be declared if, in the act of volleying the ball, the player’s momentum causes the player or anything the player is wearing or carrying to touch the non-volley zone or touch any non-volley line… It is a fault even if the ball is declared dead before the player touches the non-volley zone. That very last line that says “it is a fault even if the ball is declared dead before the player touches the non-volley zone” was not intuitive to me when I first picked up the game. I assumed that once the ball is dead (bounces twice, for example) that it didn’t matter if my momentum subsequently carried me into the Kitchen. That’s not correct, however. Momentum (stopping your body’s forward motion and establishing full control) must be stopped outside of the kitchen, regardless of what has happened to the ball. Hopefully, that helps to clarify what and when one can enter the Kitchen. Hope to see you on the Pickelball Courts! After hitting a groundstroke from the kitchen, can you remain in the kitchen and return a second shot from the kitchen if it bounces? Yes, you can remain in the kitchen as long as you don’t volley (hit the ball out of the air) while you’re in there. Letting the ball bounce and then hitting it is fine.